Give your child a birthday party that will be remembered for a lifetime. A day with horses! What better way to spend a birthday but in a stable with horses! Birthday Parties are two hours of fun. 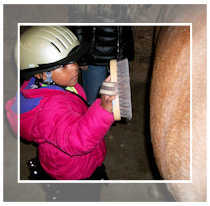 The first hour of the party includes grooming the horse, other horse and party related activities, and a short riding lesson. The second hour is for you, the birthday celebrant and guests to have cake and open gifts in our activities room. You can bring your own cake, treats or light lunch, and non-alcoholic beverages. We only ask that no candles are lit. We have outlets to keep food warm, but no refrigerator. You have a choice of celebating in our birthday room or our outdoor picnic area. Cost is $200.00 for two hours. Register or request more information by email or call 248.634.7276. 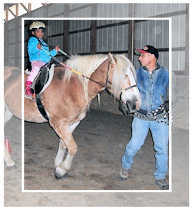 Birthday Parties are planned for eight to twelve riders, including the birthday child. Riders must be at least 4 years old and at least 42" tall. We have a weight restriction of 175 pounds on our horses. Birthday parties can be scheduled throughout the year on Saturday or Sunday afternoon at 2:00 pm or 4:00 pm and on weekday afternoons during the summer. Please check our on-line calendar for availability. $200.00 for up to 12 riders. Riders are expected to wear long pants and a boot with a small, 1/2" heel. Helmets are provided. 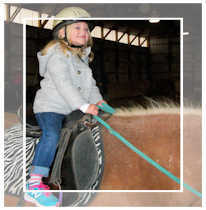 Riders may use their own ASTM/SEI certified helmets. Bicycle, roller blading, or other sport helmets are not acceptable. Participants must have a Liability Release form on file to participate in this event.